CHO or Chief Happiness Officer plays a most crucial role in the organization. They are the people who are responsible for ensuring that the employees are happy in the workplace. Nowadays more and more companies are hiring CHO’s since they have realized the importance of the happy organization. CHO’s must have the skill, knowledge as well as the passion for creating a cheerful workplace with support from top management. If you wish to reach the CHO’s across the globe, you are at the right place. Blue Mail Media provides you the best email list that lets you have seamless interaction with the prospects worldwide. With the help of our CHO Mailing List, you can have seamless interaction with the CHO’s of various industries such as Automobiles, Oil and Gas, Real Estate, Manufacturing, Telecommunication, Technology, Finance, Pharmaceuticals, Travel, Healthcare, and others. We, at Blue Mail Media, provide you the most exceptional and highly robust Chief Happiness Officer List. Using our list, you can connect with your target CHO’s all over the world. Our Chief Happiness Officer Database covers the data of several regions such as the USA, UK, Europe, Russia, Africa, North America, South America, Asia, and others. And, this list undergoes regular updates for every 90 days to keep it fresh and clean. Our team of analysts performs quality checks and verifications frequently to maintain its accuracy and reliability level. 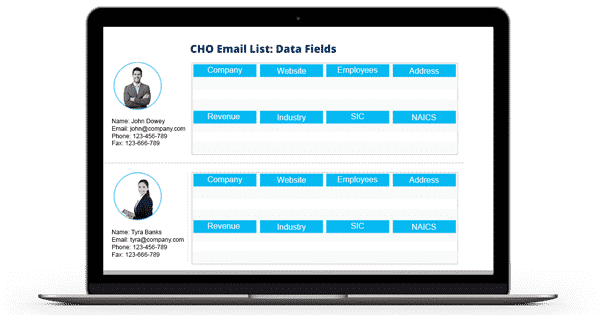 Our CHO Email Database offers more than 90% deliverability rate and stays compliant with GDPR and Anti-Spam law. Hence you do not have to think about its legitimacy. Also, to provide you with the best list with no errors and duplicate data, our team makes thousands of verification calls and sends thousands of verification email on a regular basis. Our CHO List makes your job easy. Get it now and boost your sales rate. Dial 1-888-494-0588 or send an email to sales@bluemailmedia.com for any queries! Our team of data scientists, analysts, and experts constantly dig out the most qualitative data to power your multi-channel marketing strategies. Also, we ensure that our List of CHO Email Addresses remains accurate and updated by making thousands of verification calls each day and sending out verification emails.